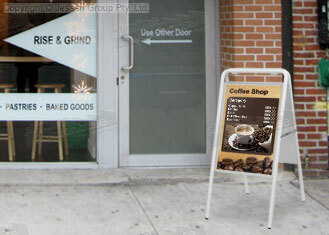 An A board display makes a great addition to your marketing needs, with restaurants, cafes, retail stores, banks, really anywhere that wishes to advertise to passersby with ease These outdoor pavement signs are dual-sided, able to reach out to more customers at once without having to take up more space on the sidewalk. You can place your custom designed A2 (420 x 594mm) graphics in the frame on each side, plenty of space to use large graphics and fonts to easily be viewed! 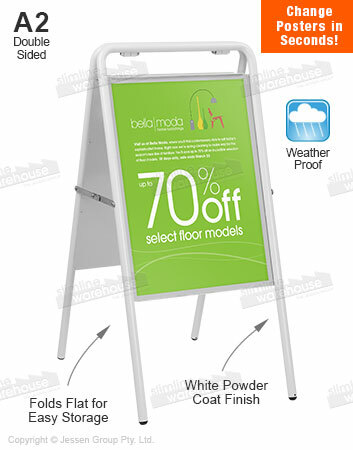 The a frame signage stand, A board display is made from iron, offering a sturdy stand that may be used for years to come by your business. 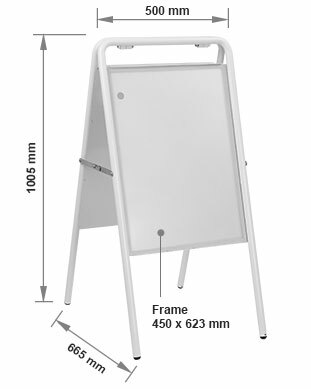 The portable display also folds small to easily be moved to different spots or stored in a small area in between uses. Changing out your graphics is easy as well, with the magnetic protective lens lifting easily off the frame without any tools needed for hassle free changes! This lens helps to protect graphics from getting damaged as well as help keep water out. We also recommend printing on the PVC substrate so that your poster is also waterproof. Order today to advertise with ease at your business!